Roast rice flour till it turns brown. Roast urad dal in the same way. Cook urad dal with 1 ½ glass of water. Let it cool and grind it to a smooth batter. Mix this with the rice flour. Add required amount of salt, cumin seeds, sesame seeds and asafoetida. Knead the dough. Add water to make the dough soft and smooth. 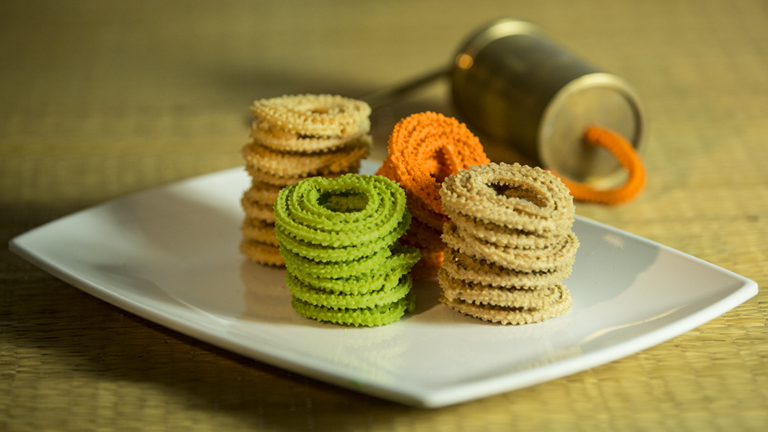 Fill the Murukku maker with the dough and press with the “murukku chillu”. Press it to get thread like murukku on oil spread banana leaf or on a plastic paper. In a pan, boil oil and add murukku into it and deep fry it till it turns brown. Store it in an air tight container.